Spent the day at the Fancy Food Show in San Francisco. I wrote a post on my first impressions for Well Fed on the Town. 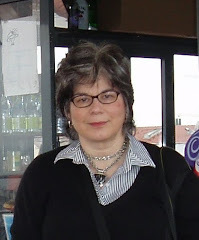 As soon as it posts (which I hope will be first thing tomorrow), I'll link to it or repost it here so you can read all about my adventures in fine (and not so fine) food. The best thing I ate today was perhaps Choc-O-Lait's Belgian hot chocolate (ganache on a stick you swirl into hot milk). If I wasn't such a chocoholic it might have been some of the wonderful cheese, sausages or other savories I sampled, but I have my priorities. Things I wished I hadn't put in my mouth -- tofu jerky (original flavor, maybe one of the other variations would have been better, but I just couldn't taste another), a vegetarian "roast," and a chocolate-covered Asian rice cracker (small but deadly). The best non-chocolate drink I sipped today -- a tie between Zhena Gypsy's Cacaoberry tea (which is good for you, too), Tea Forte's lemongrass mint infuser for spirits and cocktails and Fever-Tree's bitter lemon soda. The drink I wished I had skipped today -- a bright pink, sugary kid's drink I had been curious about. Amazingly the blue one wasn't that bad. Food that most surprised me -- Laxmi's Delights' organic golden flaxseed spread with dates and orange juice. It had a taste something like a chutney crossed with halavah and almond butter. I immediately started thinking how I would use it in grilled sandwiches, crepes and dosas. 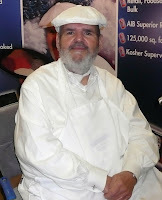 Biggest thrill -- Getting to meet Paul Prudhomme, who is one of my sister's favorite chefs. (I got his autograph for her, really nice guy.) My sister swears by his blackened redfish spice mix which she uses for everything from dips to, well, blackened redfish. Watch for the Well Fed piece for my not-to-serious take on some trends and other products I liked. The best part of the show for me was getting to meet the people who make the different food products. I hope to research and feature these producers and their products in the weeks to come. I've fixed the broken link.